Dmitry Tursunov had gotten off to a good start in the French Open. A 30-year-old Russian based in the Sacramento suburb of Granite Bay, Tursunov had upset 22nd-seeded Alexandr Dolgopolov in straight sets in the first round in Paris. On Thursday, the 60th-ranked Tursunov met No. 54 Victor Hanescu of Romania in the second round. Tursunov, who led the head-to-head series 3-1, trailed 4-6, 6-6 (1-3) when he retired after aggravating a pulled left hamstring muscle. Tursunov suffered the injury three weeks ago in Rome in his last practice for the Italian Open and retired from his first-round qualifying match. The Hanescu match was Tursunov's first since then. In an e-mail, Tursunov said he expects to be out for three more weeks and play Wimbledon, which begins June 24. He reached the fourth round at Wimbledon in 2005 and 2006 for his best Grand Slam singles results to date. Eighteenth-seeded Sam Querrey, a San Francisco native and part-time member of the Sacramento Capitals in World TeamTennis, is scheduled to face 15th-seeded Gilles Simon of France today in the third round. It's the first time Querrey has advanced that far in the French Open in seven appearances. Former Stanford star Mallory Burdette, playing in her first French Open, lost to fourth-seeded Agnieszka Radwanska of Poland 6-3, 6-2 on Wednesday in the second round. Burdette also lost in the first round of doubles, as did 2003 NCAA doubles champion Raquel Kops-Jones from Cal and ex-Stanford star Scott Lipsky. Burdette played with Sloane Stephens, Kops-Jones was seeded sixth with fellow Californian Abigail Spears, and Lipsky was seeded 11th with Santiago Gonzalez of Mexico. Top-ranked Bob and Mike Bryan, the 1998 NCAA doubles champs from Stanford, are scheduled to face Eric Butorac and Jack Sock on Saturday or Sunday in an all-American matchup in the second round. The Stanford women's program has had many great players in its storied history. They include Kathy Jordan, Sacramento natives Alycia Moulton and Patty Fendick, and Amber Liu. Add Nicole Gibbs to the list. Gibbs completed one of the greatest careers in school history, defeating fellow No. 9-16 seed Mary Weatherholt of Nebraska 6-2, 6-4 today in Urbana, Ill., for her second straight NCAA singles title. Gibbs became the first woman to repeat since Liu in 2003 and 2004. Liu is married to International Tennis Hall of Famer Michael Chang. Steve Johnson of USC won the 2011 and 2012 men's singles titles, completing his eligibility and turning pro. --The second Stanford player to win an NCAA team, singles and doubles title in her career. She led the Cardinal to the team title last week and teamed with Mallory Burdette to capture the 2012 doubles crown. Also accomplishing the feat was Linda Gates, who won team championships in 1982 and 1984, the singles title in 1985 and doubles crowns in 1984 and 1985. --The first woman to play on the championship team and win the singles crown in the same season since Duke's Mallory Cecil in 2009 at College Station, Texas. "I'm so happy to have won both the team and singles title," Gibbs, from Santa Monica in the Los Angeles area, said on gostanford.com. "But it was so sweet to win with the team. No memory can replace that." Gibbs has one more year of eligibility but said earlier this spring that she will turn pro. She's already ranked No. 177 in the world. Gibbs (24-4) won all six of her NCAA singles matches this year in straight sets and ended the year with a 14-match winning streak. Weatherholt (30-2), a senior from Prairie Village, Kan., had lost only one set entering the final. Weatherholt reportedly hyperextended her right knee late in the second set and was able to continue playing only after it had been heavily taped. She has had surgery on the knee three times, most recently last September. Nicole Gibbs (9-16), Stanford, def. Mary Weatherholt (9-16), Nebraska, 6-2, 6-4. Blaz Rola (9-16), Ohio State, def. Jarmere Jenkins (3), Virginia, 7-6 (8), 6-4. Kaitlyn Christian and Sabrina Santamaria (2), USC, def. Robin Anderson and Skylar Morton, UCLA, 6-4, 6-3. Jarmere Jenkins and Mac Styslinger (4), Virginia, def. Chris Camillone and David Holiner, Texas, 3-6, 6-2, 6-4. Nicole Gibbs of Stanford on Sunday moved within one match of repeating as the NCAA women's singles champion. The No. 9-16 seed pulled off her second consecutive 6-1, 6-1 victory, dominating unseeded freshman Breaunna Addison of Texas in the semifinals in Urbana, Ill. The match was moved indoors because of inclement weather. Gibbs improved to 23-4 this season with a 13-match winning streak. The junior from Santa Monica in the Los Angeles area will face No. 9-16 seed Mary Weatherholt of Nebraska on Monday at 10 a.m. PDT for the title. The match will be streamed live at www.ncaa.com. Weatherholt, a senior from Prairie Village, Kan., earned Nebraska's first appearance in the NCAA singles final with a 6-0, 6-3 victory over unseeded Alexa Guarachi of Alabama. It will be the first meeting between Gibbs, ranked No. 177 in the world, and Weatherholt. After leading Stanford to the team title, Gibbs has won all 10 of her sets in the singles event. Weatherholt, 30-1 with a 15-match winning streak, has lost only one set. "I think the two best players in the tournament are going to meet in the final, and that doesn't happen very often," Nebraska associate head coach Hayden Perez said on huskers.com. "It is going to be a great final, and Mary is looking forward to it." Gibbs will try to become the first repeat champion in NCAA women's singles since Stanford's Amber Liu in 2003 and 2004. Liu is married to International Tennis Hall of Famer Michael Chang. The last woman to play on the championship team and win the singles crown in the same season was Duke's Mallory Cecil in 2009 at College Station, Texas. Gibbs, who won last year's doubles title with Mallory Burdette, lost in the first round of that event this year with Kristie Ahn. Burdette turned pro last September after reaching the third round of the U.S. Open, forgoing her senior year. The last man or woman to win the "Triple Crown" -- team, singles and doubles titles -- was Matias Boeker of Georgia in 2001. See below for Sunday's complete singles and doubles results. French Open -- Sam Querrey, seeded 18th, gained revenge with a 6-3, 6-4, 6-4 victory over Lukas Lacko of Slovakia in the first round in Paris. In their only previous meeting, Lacko defeated Querrey 7-6 (6), 6-3 in the first round of the 2011 SAP Open in San Jose. The 25-year-old Querrey was born in San Francisco, 48 miles (77 kilometers) north of San Jose. Querrey, ranked 20th, earned only his second career victory in eight matches in the French Open. The part-time member of the Sacramento Capitals in World TeamTennis will play Jan Hajek of the Czech Republic. Hajek, ranked 87th, beat 20-year-old qualifier Denis Kudla of the United States 6-2, 5-7, 6-0, 6-4. Burdette, making her French Open debut, dispatched Donna Vekic of Croatia 6-3, 6-4. Burdette, ranked No. 80, will meet the winner of Monday's match between fourth-seeded Agnieszka Radwanska of Poland and Israeli veteran Shahar Peer. Nicole Gibbs (9-16), Stanford, def. Breaunna Addison, Texas, 6-1, 6-1. Mary Weatherholt (9-16), Nebraska, def. Alexa Guarachi, Alabama, 6-0, 6-3. Jarmere Jenkins (3), Virginia, def. Sebastian Fanselow (9-16), Pepperdine, 7-6 (1), 7-6 (3). Blaz Rola (9-16), Ohio State, def. Japie De Klerk, Tulsa, 6-2, 6-3. Robin Anderson and Skylar Morton, UCLA, def. Alexa Guarachi and Mary Anne Macfarlane (5-8), Albama, 7-5, 6-4. Kaitlyn Christian and Sabrina Santamaria (2), USC, def. Brynn Boren and Kata Szekely (4), Tennessee, 7-5, 7-5. Chris Camillone and David Holiner, Texas, def. Jonas Lutjen and Nik Scholtz (3), Mississippi, 6-2, 5-7, 6-3. Jarmere Jenkins and Mac Styslinger (4), Virginia, def. Henrique Cunha and Raphael Hemmeler (2), Duke, 7-5, 6-3. Defending champion Nicole Gibbs of Stanford routed fellow No. 9-16 seed Yana Koroleva of Clemson 6-1, 6-1 today in the quarterfinals of the NCAA Championships in Urbana, Ill.
Gibbs is bidding to become the first back-to-back women's champion since Stanford's Amber Liu in 2003 and 2004. Liu is married to International Tennis Hall of Famer Michael Chang. Steve Johnson of USC won the last two men's singles titles before completing his eligibility and turning pro. In the past year, he has improved his world ranking from No. 368 to No. 130. Gibbs, a 5-foot-6 (1.68-meter) junior from Santa Monica, will face unseeded Breaunna Addison of Texas in Sunday's semifinals at a time to be announced. The match will be streamed live at www.ncaa.com. Addison, a 5-foot-5 (1.65-meter) freshman from Boca Raton, Fla, outlasted seventh-seeded Gina Suarez-Malaguti of North Carolina 5-7, 6-1, 6-4. Gibbs will be fresher on Sunday after breezing in the quarters while Addison struggled. Texas is coached by Patty Fendick-McCain, a Sacramento native who won the 1986 and 1987 NCAA singles titles while attending Stanford. See below for Saturday's complete singles and doubles results. French Open -- Sam Querrey can gain revenge Sunday when he faces Lukas Lacko of Slovakia in the first round in Paris. The 18th-seeded Querrey, a San Francisco native and part-time member of the Sacramento Capitals in World TeamTennis, lost to Lacko 7-6 (6), 6-3 in the first round of the 2011 SAP Open in San Jose in their only previous meeting. San Jose is 48 miles (77 kilometers) south of San Francisco. Querrey, ranked 20th, is 1-6 lifetime in the French Open. Lacko, ranked 74th, is 1-5 (including qualifying). Lacko's win came in a 2010 marathon: 4-6, 7-6 (5), 7-6 (4), 6-7 (5), 12-10 over Michael Yani of the United States in 4 hours, 56 minutes. Yani won the 2008 Yuba City Challenger as a qualifier, beating Sacramento native Sam Warburg in the final. Warburg won the 2004 NCAA doubles title with Stanford teammate KC Corkery. Meanwhile, former Stanford star Mallory Burdette will make her French Open debut Sunday against Donna Vekic of Croatia. Burdette, who turned pro last September, is ranked No. 82. Vekic is No. 79. Dmitry Tursunov, a Russian based in the Sacramento suburb of Granite Bay, is scheduled to play 22nd-seeded Alexandr Dolgopolov of Ukraine for the second time in one month on Tuesday or Wednesday. Dolgopolov won 7-6 (2), 7-6 (3) in the second round in Munich three weeks ago to even their head-to-head record at 1-1. Maria Sanchez, a Modesto native, and Bradley Klahn, the 2010 NCAA singles champion, lost in qualifying. Sanchez, seeded fourth, fell in the second round and Klahn in the first. Both were making their French Open debut. Sunday's matches will be televised live from 2 to 7 a.m. PDT on ESPN2, 7 a.m. to 4 p.m. on Tennis Channel and 9 a.m. to noon on NBC. Mary Weatherholt (9-16), Nebraska, def. Lauren Herring (6), Georgia, 6-2, 6-2. Nicole Gibbs (9-16), Stanford, def. Yana Koroleva (9-16), Clemson, 6-1, 6-1. Breaunna Addison, Texas, def. Gina Suarez-Malaguti (7), North Carolina, 5-7, 6-1, 6-4. Alexa Guarachi, Alabama, def. Natalie Beazant, Rice, 6-4, 1-6, 6-1. Jarmere Jenkins (3), Virginia, def. Soren Hess-Olesen, Texas, 6-3, 6-2. Blaz Rola (9-16), Ohio State, def. Henrique Cunha (8), Duke, 4-6, 6-4, 6-1. Sebastian Fanselow (9-16), Pepperdine, def. Andreas Mies, Auburn, 7-5, 3-6, 6-4. Japie De Klerk, Tulsa, def. Evan King (9-16), Michigan, 3-6, 6-3, 6-2. Alexa Guarachi and Mary Anne Macfarlane (5-8), Alabama, def. Kate Fuller and Silvia Garcia (1), Georgia, 7-6 (4), 7-5. Robin Anderson and Skylar Morton, UCLA, def. Patricia Veresova and Mary Weatherholt (3), Nebraska, 6-4, 6-7 (5), 7-6 (3). Brynn Boren and Kata Szekely (4), Tennessee, def. Jacqueline Cako and Nicole Smith, Arizona State, 6-2, 6-2. Kaitlyn Christian and Sabrina Santamaria (2), USC, def. Melissa Kopinski and Rachael White, Illinois, 6-2, 6-0. Chris Camillone and David Holiner, Texas, def. Hernus Pieters and Ben Wagland (5-8), Georgia, 3-6, 6-4, 7-6 (3). Jonas Lutjen and Nik Scholtz (3), Mississippi, def. Vikram Hundal and Juan Spir, Georgia Tech, 6-2, 6-4. Jarmere Jenkins and Mac Styslinger (4), Virginia, def. Bob Overbeek and Stephane Piro, Florida, 7-6 (5), 6-4. Henrique Cunha and Raphael Hemmeler (2), Duke, def. Daniel Cochrane and Andreas Mies (5-8), Auburn, 6-2, 6-3. Nicole Gibbs of Stanford stayed alive in her quest to repeat as the NCAA women's singles champion. Gibbs, seeded 9-16, defeated fourth-seeded Cristina Sanchez-Quintanar of Texas A&M for the second time in three days, 6-4, 6-4 on Friday in the round of 16 in Urbana, Ill.
Gibbs had beaten Sanchez-Quintanar 0-6, 6-2, 6-0 at No. 1 singles on Tuesday in Stanford's 4-3 victory in the NCAA team final. Gibbs won the final 12 games in a row. "It was definitely a weird match the last time we played," Gibbs, a 5-foot-6 (1.68-meter) junior from Santa Monica in the Los Angeles area, said on gostanford.com. "I didn't really have any expectations coming into this match other than it would be gritty out there. She makes a lot of balls and makes you do some weird things to win points. I think both of us are pretty effective at using the short court and drop shots and slices, so there were a lot of really fun points, really long points, too." Gibbs is the only remaining player, man or woman, from a Northern California school in NCAA singles or doubles. Cal sophomore Zsofi Susanyi, seeded fifth, and Stanford freshman Krista Hardebeck, seeded 9-16, lost in the round of 16. Gibbs is trying to become the first repeat champion in NCAA women's singles since Stanford's Amber Liu in 2003-04. Liu is married to International Tennis Hall of Famer Michael Chang. Gibbs is scheduled to face Clemson's Yana Koroleva, a 7-5, 7-6 (6) winner over Susanyi, in the quarterfinals today at 10 a.m. PDT. The match will be streamed live at www.ncaa.com. Gibbs beat Koroleva, a 6-foot (1.83-meter) sophomore from Moscow, 6-2, 6-2 in Stanford's 5-2 victory over Clemson on Feb. 23 in Gainesville, Fla.
Susanyi, who battled injuries this season, earned All-America status for the second straight year by reaching the round of 16. She advanced to last year's semifinals. Hardebeck appeared to run out of gas after helping Stanford capture the team title and winning 6-4 in the third set in the first two rounds of singles. She fell to sixth-seeded Lauren Herring of Georgia 6-0, 6-2. In addition to earning All-America honors this season, Hardebeck was named to the NCAA All-Tournament team at No. 3 doubles and to the All-Pacific-12 Conference second team. She also won the deciding match in Stanford's 4-3 victory over two-time defending champion Florida on Monday in the NCAA semifinals. Two women from Stanford and one from Cal on Thursday reached the singles round of 16 at the NCAA Championships in Urbana, Ill. Advancing were defending champion Nicole Gibbs and freshman Krista Hardebeck of Stanford and sophomore Zsofi Susanyi of Cal. All three are scheduled to play today at 9 a.m. PDT. All singles and doubles matches will be streamed live at www.ncaa.com. Gibbs, a junior from Santa Monica, is trying to become the first woman since Stanford's Amber Liu in 2003-04 to win consecutive NCAA singles titles. Liu is married to International Tennis Hall of Famer Michael Chang. Gibbs, seeded 9-16, will face fourth-seeded Cristina Sanchez-Quintanar of Texas A&M for the second time in three days. Gibbs won 0-6, 6-2, 6-0 at No. 1 singles in the Cardinal's 4-3 victory over the Aggies on Tuesday in the NCAA team final. Fifth-seeded Zsofi Susanyi of Cal dismissed Lucia Batta of UNLV 6-3, 6-4 in an all-Hungarian matchup. Susani, a semifinalist last year, will take on 9-16 seed Yana Koroleva of Clemson. 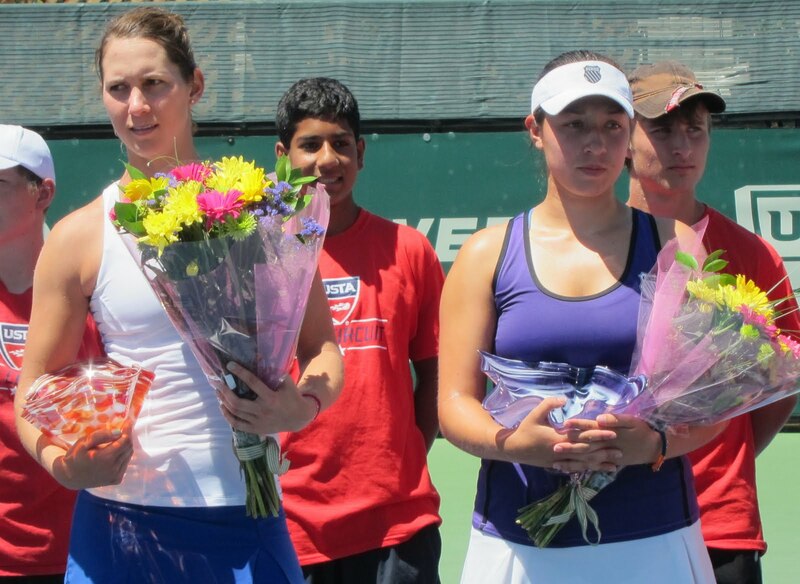 Meanwhile, Cal freshman Klara Fabikova and Santa Clara junior Katie Le lost. So did all three doubles teams from Northern California schools, two women's and two men's, in the first round. Most notably, 5-8 seeds Kristie Ahn and Gibbs fell to Isaura Enrique and Samantha Vickers of Tulsa 6-2, 6-4. Therefore, Stanford's streak of three consecutive women's doubles champions will end. Gibbs won last year's crown with Mallory Burdette, who turned pro last September after her junior year. Also losing on Thursday were Cal's Campbell Johnson and Christoffer Konigsfeldt, the Men's Doubles Team of the Year in the Pacific-12 Conference. Nicole Gibbs (9-16), Stanford, def. Ronit Yurovsky, Michigan, 6-4, 6-4. Zsofi Susanyi (5), Cal, def. Lucia Batta, UNLV, 6-3, 6-4. Krista Hardebeck (9-16), Stanford, def. Cindy Chala, Virginia Commonwealth, 1-6, 7-5, 6-4. Mary Weatherholt (9-16), Nebraska, def. Klara Fabikova, Cal, 6-2, 6-1. Robin Anderson (3), UCLA, def. Katie Le, Santa Clara, 7-6 (1), 6-2. Isaura Enrique and Samantha Vickers, Tulsa, def. Kristie Ahn and Nicole Gibbs (5-8), Stanford, 6-2, 6-4. Lauren Embree and Sophie Oyen, Florida, def. Stacey Tan and Ellen Tsay, Stanford, 6-3, 2-6, 6-4. Daniel Cochrane and Andreas Mies (5-8), Auburn, def. Campbell Johnson and Christoffer Konigsfeldt, Cal, 7-5, 6-1. One day after helping the Stanford women win the NCAA team title, Nicole Gibbs successfully began the defense of her singles crown. The junior from Santa Monica defeated Yang Pang of Arkansas 7-5, 6-4 in the first round today in Urbana, Ill.
Gibbs is seeded only 9-16 because she played professional tournaments in the fall as an amateur. That reduced her chances to beat top college players, the basis for the collegiate rankings. Also advancing today were Stanford freshman Krista Hardebeck of Santa Ana, Cal sophomore Zsofi Susanyi of Hungary, Cal freshman Klara Fabikova of the Czech Republic and Santa Clara junior Katie Le of Milpitas. Susanyi, who reached last year's semifinals, is seeded fifth, and Hardebeck is No. 9-16. Le earned the first NCAA singles victory in school history. Falling in the first round were eighth-seeded Anett Schutting of Cal, Kristie Ahn of Stanford, Klaudia Boczova of San Jose State and Jenny Jullien of Saint Mary's. Ahn had clinched Stanford's dramatic 4-3 victory over Texas A&M in Tuesday's NCAA team final. Jacqueline Cako of Arizona State upset top-seeded Lauren Embree of Florida 6-3, 6-2. All three men from Northern California schools -- Ben McLachlan and Campbell Johnson of Cal and John Morrissey of Stanford -- lost in the first round. The top two men's seeds also fell. Mitchell Frank, the hero of Virginia's 4-3 victory over UCLA in Tuesday's NCAA team final, routed No. 1 Mikelis Libietis of Tennessee 6-2, 6-1. Tsvetan Mihov of South Carolina ousted No. 2 Alex Domijan of Virginia 6-4, 3-6, 6-2. Men's and women's second-round singles and first-round doubles matches are scheduled for Thursday. Stephanie Wagner, Miami, def. Klaudia Boczova, San Jose State, 1-6, 6-4, 6-4. Petra Niedermayerova (9-16), Kansas State, def. Kristie Ahn, Stanford, 6-2, 6-1. Nicole Gibbs (9-16), Stanford, def. Yang Pang, Arkansas, 7-5, 6-4. Zsofi Susanyi (5), Cal, def. Caroline Rohde-Moe, Mississippi, 6-3, 6-0. Yana Koroleva (9-16), Clemson, def. Jenny Jullien, Saint Mary's, 3-6, 6-3, 6-4. Krista Hardebeck (9-16), Stanford, def. Pleun Burgmans, Auburn, 4-6, 6-3, 6-4. Klara Fabikova, Cal, def. Whitney Kay, North Carolina, 7-5, 6-2. Katie Le, Santa Clara, def. Emina Bektas, Michigan, 7-6 (3), 7-5. Natalie Beazant, Rice, def. Anett Schutting (8), Cal, 7-5, 6-3. Guillermo Alcorta, Oklahoma, def. Campbell Johnson, Cal, 6-2, 6-4. Anthony Rossi (4), Kentucky, def. John Morrissey, Stanford, 6-2, 6-2. Blaz Rola (9-16), Ohio State, def. Ben McLachlan, Cal, 6-2, 7-6 (4). Ahn lifts Stanford women to NCAA title; rankings, etc. She sat on the sideline with an ankle injury as Stanford lost the 2011 NCAA final, ending the Cardinal's home winning streak at 184 matches spanning more than 12 years. She missed most of last season with various injuries. She lost a potential clinching match in this year's NCAA round of 16. So Kristie Ahn's victory on Tuesday in Urbana, Ill., clinching No. 12 Stanford's dramatic 4-3 win over No. 3 Texas A&M for the NCAA title, was especially gratifying. The 25th-ranked Ahn, a junior from Upper Saddle River, N.J., outlasted No. 68 Cristina Stancu, a junior from Romania, 7-5, 4-6, 6-2 at No. 2 singles as Stanford became the lowest seed to win the NCAA title. "Honestly, it's such a cliche, but words really can't explain this one," Ahn said on gostanford.com. "From my freshman year, I've wanted this moment, and I've been bugged by injuries, and to clinch makes it that much better. "When we played USC in the round of 16, I had a shot. It could've come down to me, and I could've clinched, but (Danielle Lao) played well, and I didn't get that and was pretty upset. "Last night, I was thinking, 'How sick would it be if I could clinch tomorrow?' And when I got to 2-2 in the third set, I was smiling. I was having the best time of my life because I was thinking about how absurd it was that it was coming down to me." Stanford leads all teams with 17th NCAA women's tennis championships. Next is Florida with six. The Cardinal emerged this time by knocking off top-five teams in its last four matches. Stanford toppled No. 5 USC 4-3 in a five-hour thriller in the round of 16, No. 4 Georgia 4-1 in the quarterfinals and No. 1 Florida, the two-time defending champion, 4-3 in another nail-biter in the semifinals. Ahn could have given Stanford a 4-2 victory over Pacific-12 Conference rival USC but lost to No. 9 Lao 6-2, 4-6, 7-5 at No. 2 singles. Ellen Tsay, a sophomore from Pleasanton in the San Francisco Bay Area, saved the Cardinal with a three-set victory at No. 5 singles. Freshman Krista Hardebeck provided the clincher against Florida at No. 3 singles. No. 2 Virginia captured its first men's title, edging No. 1 UCLA 4-3. No. 39 Mitchell Frank won the clincher, saving a match point in his 0-6, 6-4, 7-5 victory over No. 22 Adrien Puget at No. 3 singles. The Cavaliers had lost in the final the past two years to USC. 1. No. 18 Stancu/Hristov (TAM) d. No. 8 Ahn/Gibbs 8-3. 2. No. 28 Tan/Tsay (STAN) d. No. 49 Wen/Sanchez-Quintanar 8-4. 3. Dillon/Hardebeck (STAN) d. Deheza/Deheza 8-5. Order of finish: 1, 2, 3. 1. No. 13 Nicole Gibbs (STAN) d. No. 4 Cristina Sanchez-Quintanar 0-6, 6-2, 6-0. 2. No. 25 Kristie Ahn (STAN) d. No. 68 Cristina Stancu 7-5, 4-6, 6-2. 3. No. 52 Nazari Urbina (TAM) d. No. 14 Krista Hardebeck 6-3, 7-6 (3). 4. No. 103 Stacey Tan (STAN) d. Ines Deheza 7-5, 6-3. 5. Anna Mamalat (TAM) d. No. 92 Ellen Tsay 6-1, 7-5. 6. Stefania Hristov (TAM) d. Natalie Dillon 6-2, 3-6, 6-1. Order of finish: 4, 1, 5, 3, 6, 2. ATP World Tour -- Dmitry Tursunov, a Moscow native based in the Sacramento suburb of Granite Bay, suffered his first doubles loss of the year on Tuesday. Tursunov and Jonathan Erlich of Israel fell to fourth-seeded Frederik Nielsen of Denmark and Andre Sa of Brazil 6-4, 5-7, 10-8 match tiebreaker in the quarterfinals of the Power Horse Cup in Dusseldorf, Germany. Last year, Nielsen and Jonathan Marray of Great Britain became the first wild cards in Wimbledon's 135-year history to win the men's doubles title. Erlich, 36, won the 2008 Australian Open with countryman Andy Ram. The Power Horse Cup is only Tursunov's second doubles tournament this year. He and Jarkko Nieminen of Finland won four matches for the BMW Open title in Munich three weeks ago. Tursunov has had to play singles qualifying in most tournaments this year, preventing him from competing in doubles. He has climbed from No. 123 to No. 58 in singles and from No. 285 to No. 149 in doubles since Feb. 1 after battling injuries. His career highs are No. 20 in singles in 2006 and No. 36 in doubles in 2008. Trying to ensure that he's healthy for the French Open, which starts Sunday, Tursunov withdrew from his first-round singles match in Dusseldorf against eighth-seeded Nikolay Davydenko of Russia. Tursunov pulled a hamstring muscle in his final practice for last week's Italian Open. Bob Bryan, 1998 NCAA doubles champion from Stanford -- Career-high No. 1 in doubles (no change), unranked in singles. Mike Bryan, 1998 NCAA doubles champion from Stanford -- Career-high No. 1 in doubles (no change), unranked in singles. Mardy Fish, Sacramento Capitals of World TeamTennis (2012-13) -- No. 41 in singles (-1), No. 338 in doubles (-4). Bradley Klahn, 2010 NCAA singles champion and 2011 NCAA doubles runner-up from Stanford -- No. 184 in singles (+1), No. 347 in doubles (-4). Scott Lipsky, 2002 NCAA doubles runner-up from Stanford -- Career-high No. 22 in doubles (+2), unranked in singles. Sam Querrey, San Francisco native, Capitals (2012-13) -- No. 20 in singles (-1), No. 96 in doubles (+2). Ryan Sweeting, Capitals (2012-13) -- No. 268 in singles (no change), No. 852 in doubles (-18). Dmitry Tursunov, Folsom resident from Russia -- No. 58 in singles (-1), No. 149 in doubles (-1). Mallory Burdette, NCAA singles runner-up in 2012 and NCAA doubles champion in 2011 and 2012 from Stanford -- Career-high No. 82 in singles (+3), No. 358 in doubles (+9). Raquel Kops-Jones, 2003 NCAA doubles champion from Cal -- No. 14 in doubles (no change), No. 1,133 in singles (+2). Megan Moulton-Levy, Capitals (2013) -- No. 64 in doubles (+1), unranked in singles. Maria Sanchez, Modesto product -- No. 115 in singles (+11), No. 119 in doubles (+6). Taylor Townsend, Capitals (2013) -- Career-high No. 344 in singles (+5), No. 536 in doubles (+1). Dusseldorf (men), early rounds, Tennis Channel, 4-8 p.m. (delay), 8 p.m.-midnight (repeat). Brussels (women), quarterfinals, Tennis Channel, 5-9 a.m. (live), 9-11 a.m. (delay), 11 a.m.-3 p.m. (repeat), 8 p.m.-midnight (repeat). Dusseldorf (men), quarterfinalss, Tennis Channel, 4-8 p.m. (delay). Brussels (women), semifinals, Tennis Channel, 5-9 a.m. (live), 9-11 a.m. (repeat). Nice (men), semifinals, Tennis Channel, 11 a.m.-3 p.m. (delay). Dusseldorf (men), semifinals, Tennis Channel, 4-8 p.m. (delay). Brussels (women), final, Tennis Channel, 6:30-8:30 a.m. (live), 6:30-8:30 p.m. (repeat). Strasbourg (women), final, Tennis Channel, 12:30-2:30 p.m. (delay). Nice (men), final, Tennis Channel, 2:30-4:30 p.m. (delay). Dusseldorf (men), final, Tennis Channel, 4:30-6:30 p.m. (delay). FRENCH OPEN, first round, ESPN2, 2-7 a.m. (live); Tennis Channel, 7 a.m.-4 p.m. (live); NBC, 9 a.m.-noon (live). FRENCH OPEN, first round, ESPN2, 2-7 a.m. (live), Tennis Channel, 7 a.m.-4 p.m. (live). Wednesday-Monday -- NCAA Men's and Women's Individual Championships, Urbana, Ill., www.ncaa.com, www.fightingillini.com. Sunday-June 9 -- FRENCH OPEN, www.rolandgarros.com. 2012 champions: Rafael Nadal, Maria Sharapova, Max Mirnyi-Daniel Nestor, Sara Errani-Roberta Vinci. June 24-July 7 -- WIMBLEDON, www.wimbledon.com. 2012 champions: Roger Federer, Serena Williams, Jonathan Marray-Frederik Nielsen, Serena Williams-Venus Williams. June 29-July 6 -- $50,000 Gold River Women's Challenger, Gold River Racquet Club, Gold River, Calif., www.usta.com. 2012 champions: Maria Sanchez, Asia Muhammad-Yasmin Schnack. July 6-8 -- West Coast Junior Championships, Rio del Oro Racquet Club, 119 Scripps Dr., Sacramento 95825, www.norcal.usta.com. July 7 -- Sacramento Capitals open season vs. Texas Wild in World TeamTennis, Capitals Stadium at Sunrise Mall in Citrus Heights, Calif., 7:35 p.m., www.saccaps.com. July 22-28 -- Bank of the West Classic, Stanford, www.bankofthewestclassic.com. 2012 champions: Serena Williams, Marina Erakovic-Heather Watson. July 25 -- World TeamTennis conference championships at highest seeds, www.wtt.com. July 28 -- World TeamTennis Finals at Eastern Conference champion, www.wtt.com. Aug. 5-11 -- $100,00 Comerica Bank Challenger, Seascape Sports Club, Aptos, Calif., www.seascapesportsclub.com/challenger. 2012 champions: Steve Johnson, Rik de Voest-John Peers. Normally, a college team doesn't want a dual match to come down to a freshman. Krista Hardebeck, however, is no ordinary freshman. At 15, the resident of Santa Ana in the Los Angeles area was featured in the Aug. 2, 2010, issue of Sports Illustrated as a future star. The following year, she reached the semifinals of a $25,000 professional tournament and the quarterfinals of a $50,000 pro event. Hardebeck, who arrived at Stanford last fall as the top recruit in the country, has lived up to expectations. On Monday, she notched the biggest win of her collegiate career, clinching the No. 12 Cardinal's dramatic 4-3 victory over No. 1 and two-time defending champion Florida in the semifinals of the NCAA Team Championships in Urbana, Ill.
After trailing 5-1 in the second set, the 14th-ranked Hardebeck rallied to defeat Alexandra Cercone, a junior ranked 51st, 6-7 (5), 7-6 (5), 6-3 at No. 3 singles. "In the third set, I could tell she was maybe getting a little tired," Hardebeck, who leads Stanford with 34 singles victories this season, said on gostanford.com. "I just told myself to really keep pressing. I knew that the longer I could keep her out here was going to be to my benefit. I knew once it got to 3-3 (in the third set) that I had a really good chance to outlast her." Stanford, the lowest seed to reach the title match since No. 12 UCLA lost to Georgia Tech in 2007, has knocked off three top-five teams in a row. The Cardinal toppled No. 5 USC 4-3 in a five-hour thriller in the round of 16 and No. 4 Georgia 4-1 in the quarterfinals. Stanford (21-4) will try to make it four straight when it plays No. 3 Texas A&M for the title on Tuesday at 3 p.m. PDT. The Aggies edged No. 7 UCLA 4-3 to prevent an all-Pacific-12 Conference final. Stanford seeks its 17th NCAA women's team championship, and first since 2010, and Texas A&M its first. The dual match will be streamed live at www.ncaa.com. The Cardinal raced to a 3-0 lead against Florida with victories in the doubles and at the top two singles positions before the Gators tied the score with wins in the last three singles spots. A marquee matchup at No. 1 singles turned into a rout as Nicole Gibbs, the defending NCAA singles (and doubles) champion, crushed top-ranked Lauren Embree 6-0, 6- 1 to give Stanford a 2-0 lead. "I'm still in shock," said Gibbs, a junior from Santa Monica in the Los Angeles area. "I was not expecting that kind of victory. Honestly, I felt like I was out there fighting for every game because Lauren Embree doesn't give you any room for messing around. If I had let her in during the first set or second set, she would have clawed her way back into the match. I was really disciplined to the game plan I came in with, and that was able to keep me calm and centered when I was down." Stanford improved to 18-13 all-time against Florida and 10-3 in the postseason. The Gators had won 4-2 in Gainesville, Fla., on Feb. 24. The Cardinal avenged not only that loss but a heartbreaking 4-3 setback in the 2011 NCAA final at Stanford. Playing without then-No.15 Kristie Ahn at No. 4 singles because of an ankle injury, Stanford suffered its first home loss in 185 matches spanning more than 12 seasons. In the deciding match of the 2011 final at No. 2 singles, Stanford's Mallory Burdette led 4-0 in the third set before falling to Embree 5-7, 6-3, 7-6 (6) in a battle of sophomores. Burdette turned pro last September and has climbed to No. 82 in the world. Ahn, now a junior ranked 25th, gave Stanford its 3-0 lead Monday with a 6-1, 6-4 triumph over No. 17 Sophie Oyen at No. 2 singles. In today's men's final, No. 1 UCLA will face No. 2 Virginia, the runner-up to USC the last two years. 1. No. 8 Ahn/Gibbs (STAN) d. No. 11 Embree/Oyen 8-3. 2. No. 28 Tan/Tsay (STAN) d. Cercone/Hitimana 8-3. 3. Danielle Collins/Morgan (FLA) led Dillon/Hardebeck 6-3. Order of finish: 1, 2. 1. No. 13 Nicole Gibbs (STAN) d. No. 1 Lauren Embree 6-0, 6-1. 2. No. 25 Kristie Ahn (STAN) d. No. 17 Sofie Oyen 6-1, 6-4. 3. No. 14 Krista Hardebeck (STAN) d. No. 51 Alexandra Cercone 6-7 (5), 7-6 (5), 6-3. 4. No. 89 Brianna Morgan (FLA) d. No. 103 Stacey Tan 6-1, 6-3. 5. No. 123 Olivia Janowicz (FLA) d. No. 92 Ellen Tsay 6-2, 3-6, 6-4. 6. Caroline Hitimana (FLA) d. Natalie Dillon 1-6, 6-1, 6-0. Order of finish: 1, 2, 4, 6, 5, 3. ATP World Tour -- Dmitry Tursunov, returning from a pulled hamstring muscle suffered while practicing for last week's Italian Open, remained undefeated in doubles this year with a first-round victory in the Power Horse Cup in Dusseldorf, Germany. Tursunov, a Moscow native based in the Sacramento suburb of Granite Bay, and Jonathan Erlich of Israel edged Tommy Haas of Germany and Michael Russell of the United States 6-4, 6-7 (5), 10-8 match tiebreaker. Tursunov, 30, is the youngster of the four. Erlich is 36, and Haas and Russell are both 35. Tursunov and Erlich will meet fourth-seeded Frederik Nielsen of Denmark and Andre Sa of Brazil on Tuesday in the quarterfinals. Last year, Nielsen and Jonathan Marray of Great Britain became the first wild cards in Wimbledon's 135-year history to win the men's doubles title. Erlich won the 2008 Australian Open with countryman Andy Ram. Trying to ensure that he's ready for the French Open, which starts Sunday, Tursunov withdrew from his first-round singles match in Dusseldorf against eighth-seeded Nikolay Davydenko of Russia. The Cal women couldn't knock off top-ranked and two-time defending champion Florida at the NCAA Team Championships in Urbana, Ill.
Now Stanford gets a chance. The Gators eliminated the Bears 4-2 in today's quarterfinals. In the clinching match, No. 116 Caroline Hitimana defeated Annie Goransson 6-3, 6-2 at No. 6 singles. No. 12 Stanford upset its second straight top-five team, topping No. 4 Georgia 4-1. After stunning No. 5 USC 4-3 in a five-hour thriller on Friday, the Cardinal won a match despite losing the doubles point for the first time in two years. Krista Hardebeck, ranked 14th, clinched Stanford's victory with a 2-6, 6-1, 6-1 decision over No. 104 Silvia Garcia in a matchup of freshmen at No. 3 singles. Stanford, a 16-time NCAA champion, advanced to the semifinals for the 28th time in 32 years. But the Cardinal became the lowest-seeded team to reach the semis since No. 12 UCLA in 2007. Stanford (20-4) will meet Florida (26-2) on Monday at 3 p.m. PDT. The dual match will be streamed live at www.ncaa.com. The Cardinal will be out for revenge after losing a 4-3 heartbreaker to the Gators in the 2011 NCAA final at Stanford. Playing without 15th-ranked Kristie Ahn at No. 4 singles because of an ankle injury, Stanford suffered its first home loss in 185 matches spanning more than 12 seasons. In the deciding match at No. 2 singles, Stanford's Mallory Burdette led 4-0 in the third set before falling to Lauren Embree 5-7, 6-3, 7-6 (6) in a battle of sophomores. Burdette turned pro last September and has climbed to No. 82 in the world. Embree is ranked No. 1 in the NCAA for Florida. Ahn is now a junior who plays No. 2 singles for Stanford. She is ranked No. 25. In today's other quarterfinals, No. 7 UCLA pounded No. 2 North Carolina 4-1, and No. 3 Texas A&M whipped No. 6 Miami 4-0. ATP World Tour -- Former Stanford stars Bob and Mike Bryan won their sixth doubles title of the year and 88th overall on Sunday. The top-seeded American twins defeated sixth-seeded Indians Mahesh Bhupathi and Rohan Bopanna 6-2, 6-3 in 52 minutes to capture the Italian Open in Rome for the third time. 1. No. 1 Fuller/Garcia (UGA) d. No. 8 Ahn/Gibbs 8-5. 2. No. 52 Herring/Kowase (UGA) led No. 28 Tan/Tsay 6-4, abandoned. 3. Lilly Kimbell/King (UGA) d. Dillon/Hardebeck 8-3. 1. No. 13 Nicole Gibbs (STAN) led No. 6 Lauren Herring 6-1, 3-6, 3-0, abandoned. 2. No. 25 Kristie Ahn (STAN) d. No. 19 Maho Kowase 6-0, 6-1. 3. No. 14 Krista Hardebeck (STAN) d. No. 104 Silvia Garcia 2-6, 6-1, 6-1. 4. No. 103 Stacy Tan (STAN) d. Kate Fuller 6-4, 7-5. 5. No. 92 Ellen Tsay (STAN) d. Ayaka Okuno 6-1, 6-2. 1. No. 11 Lauren Embree/Sofie Oyen (FLA) vs. No. 33 Lynn Chi/Anett Schutting 8-4. 2. Klara Fabikova/Annie Goransson (CAL) def. Alexandra Cercone/Caroline Hitimana 8-4. 3. Danielle Collins/Brianna Morgan (FLA) def. Kelly Chui/TaylerDavis 8-4. 1. No. 1 Lauren Embree (FLA) def. No. 8 Anett Schutting 6-2, 6-0. 2. No. 43 Klara Fabikova (CAL) def. No. 17 Sofie Oyen 7-5, 6-4. 3. No. 5 Zsofi Susanyi (CAL) def. No. 51 Alexandra Cercone 6-1, 6-1. 4. No. 70 Lynn Chi (CAL) vs. No. 89 Brianna Morgan, abandoned. 5. No. 123 Olivia Janowicz (FLA) def. Tayler Davis 6-1, 6-4. 6. No. 116 Caroline Hitimana (FLA) def. Annie Goransson 6-3, 6-2. Seeking a better field and more fans, organizers are making several changes for the upcoming FSP Gold River Women's Challenger. Last year's inaugural $50,000 tournament was held during the first week of the French Open in late May and early June. That hurt the Gold River field because most players who had lost in French Open qualifying immediatedly traveled elsewhere in Europe to play on grass and begin preparing for Wimbledon a few weeks later. The top seed at Gold River was Russia's Elena Bovina, then ranked No. 243 in the world. All Gold River matches were played during the day, when many fans worked and temperatures soared into the 90s Fahrenheit (32 and above, Celsius), and culminated in a traditional Sunday final. This year's $50,000 tournament at the Gold River Racquet Club will be played five weeks later and feature night matches, including a Saturday final. The main draw is scheduled for July 1-6, the second week of Wimbledon. Qualifying will begin on Saturday, June 29. As soon as players lose at Wimbledon, including the qualifying event, many will head to the United States for the summer hardcourt season. Top-100 players generally will compete on the elite WTA tour, but several competitors ranked in the 100s likely will play at Gold River. The entry list will be released three weeks beforehand. Modesto product Maria Sanchez won her first professional singles title last year at Gold River after graduating from USC in 2011. Now ranked No. 126, she is mentored by International Tennis Hall of Famer Chris Evert in Boca Raton, Fla.
Asia Muhammad and Sacramento-area resident Yasmin Schnack captured the Gold River doubles title last year, but Schnack retired at the end of last season at 24. Admission at Gold River will be free during qualifying, $10 Tuesday through Thursday during the main draw and $20 Friday and Saturday. For more information or to purchase tickets, visit www.goldriverchallenger.com. The Stanford women admitted it. They wanted revenge against Pacific-12 Conference rival USC. Thanks to a series of clutch performances, especially by Ellen Tsay, they got it. No. 12 Stanford edged No. 5 USC 4-3 in a five-hour thriller on Friday in Urbana, Ill., to reach the quarterfinals of the NCAA Team Championships. No. 8 Cal joined Stanford in the quarters, coasting past No. 9 Alabama 4-1. Tsay, a sophomore from Pleasanton in the San Francisco Bay Area, won it for the Cardinal by outlasting Gabriella DeSimone 5-7, 7-5, 6-3 at No. 5 singles. Tsay won the last three games to clinch a match for a team-leading seventh time this season. "This is the first match I really felt like I clinched," Tsay, ranked No. 92, said on gostanford.com. "In the other ones I've clinched, other people on our team were up, and if I hadn't won my match, we probably would have won. This is the biggest moment for me so far in my two years." USC defeated Stanford in the NCAA quarterfinals last year and routed the Cardinal 6-1 six weeks ago in Los Angeles. "It started from the moment I stepped on the court," Tsay said. "If I had waited until I was the clinching match and suddenly tried to be mentally tough, that wouldn't have worked. We were all very intense today. We really wanted to get our revenge from the previous matches. From the moment I stepped on the court, I was ready to hunker down." Added Stanford coach Lele Forood: "It was a marathon match. It's really sweet. We had to really battle through USC. They eliminated us in the tournament last year. They killed us 6-1 at their place a little over a month ago. We were looking for payback. It was a very close match, and really, it could have gone either way." Stanford won the doubles point with a 9-8 (2) victory by No. 8 Kristie Ahn and Nicole Gibbs over No. 2 Kaitlyn Christian and Sabrina Santamaria, the Pac-12 Doubles Team of the Year that had been 32-0 this season. With Stanford leading 2-1, 13th-ranked Nicole Gibbs of the Cardinal overcame a 5-1 deficit in the first set to beat No. 2 Santamaria 7-6 (3), 6-2. Gibbs, a junior from Santa Monica, will defend her NCAA singles and doubles titles beginning Wednesday in Urbana. USC, however, rallied to tie the score 3-3. Sophomore Zoe Scandalis, ranked 27th, defeated freshman Krista Hardebeck, ranked 14th, 6-3, 7-6 (5), then No. 9 Danielle Lao pulled out a 6-4, 2-6, 7-5 win over No. 25 Ahn. A few minutes later, Tsay completed her match against DeSimone. On Sunday at 10 a.m. PDT in the quarterfinals, Stanford (19-4) will meet No. 4 Georgia (24-3), and Cal (19-5) will play top seed and two-time defending champion Florida (25-2). The dual matches will be streamed live at www.ncaa.com. Florida lost its top player of the past two years when Allie Will turned pro after her junior season, but Gators senior Lauren Embree is ranked No. 1. See below for full Stanford and Cal results. Pac-12 men's awards -- The conference coaches voted Cal's Campbell Johnson and Christoffer Konigsfeldt as the Doubles Team of the Year and Johnson as the Freshman/Newcomer of the Year. The coaches selected UCLA sophomore Dennis Novikov as the Singles Player of the Year and the Bruins' Billy Martin as the Coach of the Year. Johnson, a junior transfer from Georgia, and Konigsfeldt, a senior from Denmark, are 11-7 at No. 1 singles and ranked 26th nationally. They will compete in the NCAA Doubles Championships. Johnson, who lives in the San Diego suburb of Rancho Santa Fe, played primarily at No. 3 singles and went 26-12 overall. Ranked 60th nationally, he was chosen as an alternate for the NCAA Singles Championships. 1. No. 7 Alexa Guarachi/Mary Anne Macfarlane (Ala) def. No. 33 Lynn Chi/Anett Schutting, 8-5. 2. Klara Fabikova/Annie Goransson (Cal) vs. No. 83 Antonia Foehse/Maya Jansen, abandoned. 3. Natalia Maynetto/Emily Zabor (Ala) def. Kelly Chui/Tayler Davis, 8-5. 1. No. 8 Anett Schutting (Cal) def. No. 34 Mary Anne Macfarlane, 6-3, 7-6 (1). 2. No. 43 Klara Fabikova (Cal) def. No. 36 Alexa Guarachi, 6-2, 0-6, 6-3. 3. No. 5 Zsofi Susanyi (Cal) vs. Maya Jansen, 6-3, 4-6, 6-3. 4. No. 70 Lynn Chi (Cal) def. No. 118 Antonia Foehse, 7-6 (1), 6-0. 5. Tayler Davis (Cal) vs. Natalia Maynetto, abandoned. 6. Annie Goransson (Cal) vs. Emily Zabor, abandoned. Order of finish: 2, 4, 1, 3. Records: Cal 19-5, Alabama 21-6. 1. No. 8 Ahn/Gibbs (Stan) d. No. 2 Christian/Santamaria, 9-8 (2). 2. Olmos/Scandalis (USC) d. No. 28 Tan/Tsay, 8-6. 3. Dillon/Hardebeck (Stan) d. DeSimone/Lao, 8-1. Order of finish: 3, 2, 1. 1. No. 13 Nicole Gibbs (Stan) d. No. 2 Sabrina Santamaria, 7-6 (3), 6-2. 2. No. 9 Danielle Lao (USC) d. No. 25 Kristie Ahn, 6-4, 2-6, 7-5. 3. No. 27 Zoe Scandalis (USC) d. No. 14 Krista Hardebeck, 6-3, 7-6 (5). 4. No. 103 Stacey Tan (Stan) d. Giuliana Olmos, 6-2, 6-2. 5. No. 92 Ellen Tsay (Stan) d. Gabriella DeSimone, 5-7, 7-5, 6-3. 6. Kaitlyn Christian (USC) d. Natalie Dillon, 6-3, 6-1. Order of finish: 4, 6, 1, 3, 2, 5. Records: Stanford 19-4, USC 23-3. Now it's up to the women. The last remaining men's team from Northern California lost Thursday in the NCAA Division I Championships as No. 18 Cal fell to No. 3 Virginia in the round of 16 for the second straight year 4-0 in Urbana, Ill. The No. 1 singles match between third-ranked Jarmere Jenkins of Virginia and No. 38 Ben McLachlan was abandoned. The Bears ended the season 16-10. Virginia, the NCAA runner-up for the past two years, improved to 27-0. Last week, No. 40 Stanford and unranked Sacramento State lost in the opening round. It was the first time the Cardinal fell in the opening round in its 35 appearances in the NCAA Championships. In the women's round of 16 today in Urbana, No. 8 Cal (18-5) will face No. 9 Alabama (21-5) at 7 a.m. PDT, and No. 12 Stanford (18-4) will play No. 5 USC (23-2) at 11:40 a.m. Live streaming is available at www.ncaa.com. Cal and Alabama have met only once, with the Bears winning 8-1 in Berkeley in 1989. USC routed Stanford 6-1 in Los Angeles on March 30 in their only meeting this year. Pac-12 women's awards -- Cal placed two women and Stanford one on the All-Pac-12 first team. Honored were sophomore Zsofi Susanyi and junior Anett Schutting of the Bears and junior Nicole Gibbs of Stanford. Gibbs will defend her singles and doubles titles in the NCAA Championships beginning May 22. Second-team selections included junior Kristie Ahn and freshman Krista Hardebeck of Stanford and freshman Klara Fabikova of Cal. Bears freshman Lynn Chi received honorable mention. Singles Player of the Year -- USC sophomore Sabrina Santamaria. Doubles Team of the Year -- Santamaria and junior Kaitlyn Christian. Freshman/Newcomer of the Year -- UCLA's Kyle McPhillips. Coach of the Year -- Richard Gallien. Tursunov hurt; so what else is new? Rankings, etc. Right on cue, Dmitry Tursunov got hurt. But the injury appears to be minor. After winning the Munich doubles title on May 5 and with the French Open approaching, the Moscow native, now based in the Sacramento area, retired from his first-round singles qualifying match at the Italian Open in Rome. Trailing 3-4 against Illya Marchenko of Ukraine, Tursunov quit with a pulled left hamstring muscle. He hopes to return for next week's Power Horse Cup in Dusseldorf and is confident he'll play in the French Open, which begins May 26. Tursunov, 30, reached the French Open doubles semifinals in 2008 and quarterfinals in 2007 and 2009, all with fellow Russian Igor Kunitsyn. Tursunov's best singles results at Roland Garros are third-round appearances in 2006 and 2008. Tursunov has spent much of the past four years battling injuries. Since Feb. 1, however, he has improved from No. 123 to No. 57 in the world in singles and from No. 283 to No. 148 in doubles. He reached career highs of No. 20 in singles in 2006 and No. 36 in 2008. Bryans triumph -- Top-seeded Bob and Mike Bryan won their fifth Madrid Open title and 87th overall Sunday, defeating seventh-seeded Alexander Peya of Austria and Bruno Soares of Brazil 6-2, 6-3. The identical twin sons of Wayne Bryan, the longtime coach of the Sacramento Capitals in World TeamTennis, turned 35 on April 29. They won the 1998 NCAA doubles title as Stanford sophomores, then turned pro. Junior showdown -- The recent Rio del Oro Junior Championships in Sacramento featured a showdown between two players who ended 2012 ranked in the nation's top 10 in the boys 12s. The match lived up to its billing as then-No. 1 Keenan Mayo of Roseville outlasted then-No. 9 Jenson Brooksby of Sacramento 6-4, 2-6, 7-5 in the boys 14 semifinals. The second-seeded Mayo then beat top-seeded Austen Huang of Elk Grove 6-4, 4-6, 6-0 in the final. Mardy Fish, Sacramento Capitals of World TeamTennis (2012-13) -- No. 40 in singles (+2), No. 334 in doubles (+4). Bradley Klahn, 2010 NCAA singles champion and 2011 NCAA doubles runner-up from Stanford -- No. 185 in singles (+2), No. 343 in doubles (+3). Scott Lipsky, 2002 NCAA doubles runner-up from Stanford -- Career-high No. 24 in doubles (+2), unranked in singles. Sam Querrey, San Francisco native, Capitals (2012-13) -- No. 19 in singles (-1), No. 98 in doubles (+11). Ryan Sweeting, Capitals (2012-13) -- No. 268 in singles (+2), No. 834 in doubles (-5). Dmitry Tursunov, Folsom resident from Russia -- No. 57 in singles (no change), No. 148 in doubles (-2). Mallory Burdette, NCAA singles runner-up in 2012 and NCAA doubles champion in 2011 and 2012 from Stanford -- No. 85 in singles (-1), No. 367 in doubles (-3). Raquel Kops-Jones, 2003 NCAA doubles champion from Cal -- No. 14 in doubles (no change), No. 1,135 in singles (-2). Megan Moulton-Levy, Capitals (2013) -- No. 65 in doubles (-2), unranked in singles. Maria Sanchez, Modesto product -- No. 126 in singles (-2), No. 125 in doubles (-2). Taylor Townsend, Capitals (2013) -- No. 349 in singles (no change), No. 537 in doubles (-4). Rome (men), early rounds, Tennis Channel, 3 a.m.-12:30 p.m. (live), 6 p.m.-midnight (repeat). Rome (men), early rounds, Tennis Channel, 3 a.m.-2 p.m. (live), 2 p.m.-midnight (repeat). Rome (men), quarterfinals, Tennis Channel, 3-9 a.m. (live), 9:30-11 a.m. (repeat), noon-2 p.m. (live), 6-10 p.m. (repeat). Rome (women), quarterfinals, Tennis Channel, 2-6 p.m. (delay). Rome (women), semifinals, Tennis Channel, 3-7 a.m. (live). Rome (men), semifinals, Tennis Channel, 7-9:30 a.m. (live), 11 a.m.-1:30 p.m. (live). Rome (men and women), semifinals, Tennis Channel, 1:30-10:30 p.m. (repeat). Rome (women), final, Tennis Channel, 4:30-7 a.m. (live), 10:30 a.m.-12:30 p.m. (repeat), 7:30-9:30 p.m. (repeat). Rome (men), final, Tennis Channel, 7-9:30 a.m. (live), 12:30-3 p.m. (repeat), 5-7:30 p.m. (repeat). Thursday-May 21 -- NCAA Men's and Women's Team Championships, round of 16 through finals, Urbana, Ill., www.ncaa.com, www.fightingillini.com. May 22-27 -- NCAA Men's and Women's Individual Championships, Urbana, Ill., www.ncaa.com, www.fightingillini.com. May 26-June 9 -- FRENCH OPEN, www.rolandgarros.com. 2012 champions: Rafael Nadal, Maria Sharapova, Max Mirnyi-Daniel Nestor, Sara Errani-Roberta Vinci. ELK GROVE -- Cameron Klinger and Lane Leschly, nationally ranked 15-year-olds, live about 20 miles (32 kilometers) apart in the San Francisco Bay Area. So they've played each other since they were toddlers, right? Klinger and Leschly met for the first time Monday in the boys 16 singles final of the USTA National Open at the Laguna Creek Racquet Club. Klinger, ranked No. 34 in the 18s and No. 32 in the 16s, won the battle of hard-hitting baseliners 6-3, 7-5 for his second singles title in two weeks in the Sacramento area. He also took the 18s crown at the Rio del Oro Championships at the Rio del Oro Racquet Club in Sacramento. Leschly, ranked No. 23 in the 16s, breezed to the 16s title in that tournament. The best career results of both players came in the 14s of the USTA National Hardcourt Championships in San Antonio. Klinger swept the singles and doubles titles in 2011, and Leschly reached the singles quarterfinals and doubles final last summer. In Monday's girls 16 singles final, second-seeded Claire Liu routed third-seeded Sarah Hu of Oakland 6-0, 6-3. Liu, from Thousand Oaks in the Los Angeles area, will turn 13 on May 25. She defeated CiCi Bellis of Atherton to win the 12s singles crown at the prestigious Orange Bowl in Coral Gables, Fla., in 2011. Klinger, from urban San Jose, is eight months older than Leschly, of wealthy Atherton near Stanford University. Klinger will turn 16 on Aug. 1; Leschly turned 15 on April 2. Also, Klinger has trained out of the area, according to Leschly's mother, Darcy. Klinger was not available after Monday's match. The players did team up in doubles in the USTA National Open, winning the title on Sunday. Both Klinger and Leschly possess strong serves and topspin groundstrokes and employ two-handed backhands. That's where the similarities end, though. Klinger, 6-foot-2 (1.88 meters), has more firepower than Leschly, 5-9 (1.75 meters), and is far more emotional on the court. After hitting winners, Klinger almost invariably pumped his fist. After breaking serve, he yelled "C'mon!" And after committing errors, he swatted the ball against the fence, dropped his racket in frustration or berated himself aloud. Leschly, meanwhile, remained stoic throughout the match. He even smiled after netting an easy overhead on match point. When is the last time you saw that? "I try to keep my composure on the court," Leschly, who knocked off top-seeded Kalman Boyd in the first round, explained afterward. "That's one of the main things my dad tells me. As long as I keep my composure, I feel it's a good match." Mark Leschly, a managing partner of a venture capital firm and Lane's coach, attended Monday's match with Darcy. Mark, the son of Danish Davis Cup veteran Jan Leschly, reached No. 22 in the college rankings as a Harvard junior in 1989 and briefly played professionally before a rotator cuff injury ended his career. Monday's match featured many long baseline rallies, and one game in the first set lasted 24 points. Leschly served for the second set at 5-4. "I thought we both played well (in the match)," Leschly said. "Cameron stepped it up and played a great game when I was serving at 5-4. He went up 40-0. Kudos to him." Leschly was coming off a 6-7 (5), 6-4, 7-6 (6) victory over fifth-seeded Jonathan Li of Cupertino in the semifinals. "I was a bit sore in the morning, but it had no effect in the (final)," said Leschly, who was broken early in the first set. "I got loosened up and was fine. Cameron played better than me today." USTA National Open boys 14s in Alameda -- Third-seeded Sean Hill of Berkeley topped second-seeded Alafia Ayeni of San Diego 4-6, 6-2, 6-3 for the title at the Harbor Bay Club. National 30 Indoors in Gold River -- Top seeds Calle Hansen of Newbury Park in the Los Angeles area and Romana Tedjakusuma of Tracy retained their singles titles at the Spare Time Indoor Tennis Center. The 6-foot-5 (1.96-meter) Hansen, a 33-year-old native of Sweden and former Pepperdine All-American, beat second seed and four-time champion Jan Tiilikainen of Reno 7-5, 6-2. The 5-foot-2 (1.57-meter) Tedjakusuma, a 36-year-old native of Indonesia, dominated Francesca LaO of Bellevue, Wash., 6-2, 6-0. Tedjakusuma peaked at No. 82 in the world at 17 in 1994 but later suffered burnout and quit to attend Nicholls State in Thibodaux, La. Cameron Klinger, San Jose, and Lane Leschly, Atherton, def. Andrew Gu, El Cerrito, and Jonathan Li (3), Cupertino, 8-3. Kelly Chen, Cerritos, and Claire Liu, Thousand Oaks, def. Jessica Livianu, Brooklyn, N.Y., and Ally McKenzie, Glendale, 8-2. Alafia Ayeni, San Diego, and Stefano Tsorotiotis (3), Libertyville, Ill., def. Nate Eazor, Dallas, and Kailas Shekar (4), Cupertino, 8-5. Calle Hansen, Newbury Park, and Sherif Zaher (1), Folsom, def. Ryan Sablan, Martinez, and Jeff Thomsen, Newport Beach, 6-3, 6-4. Marisue Jacutin-Mariona, Los Altos, Romana Tedjakusuma (1), Tracy, def. Michelle Chapple, Rancho Murieta, and Isabella Kling (2), Orangevale, 6-1, 6-3. Tedjakusuma and Zaher (1) def. Sarah Ansboury, Portland, Ore., and Monty Basnyat, Sacramento, 6-1, 6-0. Two juniors from the San Francisco Bay Area knocked off No. 1 seeds in the semifinals of national junior tournaments in Northern California on Sunday. In the USTA National Open girls 16s at the Laguna Creek Racquet Club in Elk Grove, third-seeded Sarah Hu of Oakland took out Nadia Gizdova of Columbia, Md., 6-3, 6-2. In the USTA National Open boys 14s at the Harbor Bay Club in Alameda, third-seeded Sean Hill of Berkeley knocked off Alexandre Rotsaert of Villanova, Pa., 7-5, 6-1. Hu will play second-seeded Claire Liu of Thousand Oaks for the title today at 10 a.m. Liu beat fourth-seeded Alaina Miller of Saratoga 6-3, 6-4. Hill will meet second-seeded Alafia Ayeni of San Diego in today's final at 10:45 a.m. Ayeni advanced with a 6-2, 7-6, 7-6 (3) victory over unseeded Stefano Tsorotiotis of Libertyville, Ill. 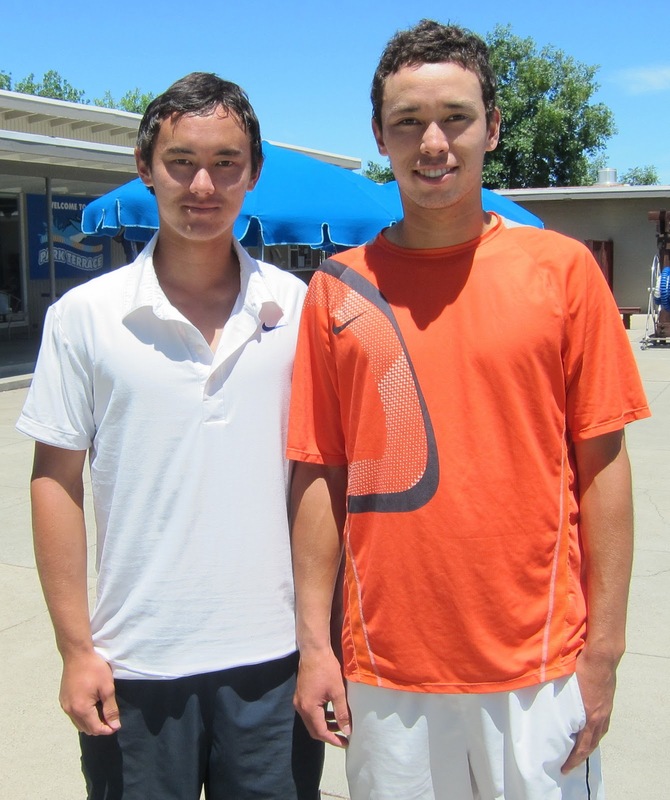 In the boys 16s in Elk Grove, third-seeded Cameron Klinger of San Jose will face unseeded Lane Leschly of Atherton for the title today at 10 a.m.
Klinger topped unseeded Conrad Russell of Palo Alto 7-6 (4), 4-2, retired, and Leschly edged fifth-seeded Jonathan Li of Cupertino 6-7 (5), 6-4, 7-6 (6). National 30 Indoors in Gold River -- Top seeds and defending champions Romana Tedjakusuma of Tracy and Calle Hansen of Newbury Park will defend their singles titles today at the Spare Time Indoor Tennis Center. Tedjakusuma will take on unseeded Francesca LaO of Bellevue, Wash., at 9 a.m., and Hansen will go against second-seeded Jan Tiilikainen of Reno at 11 a.m.
Three Northern California teams advanced Saturday to the round of 16 in the NCAA Championships, while two others were eliminated. Heading to Urbana, Ill., for the Sweet 16 are the No. 8 Cal women, No. 12 Stanford women and No. 18 Cal men. Heading home for the offseason are the Sacramento State and San Jose State women. The women of Cal (18-5) and Stanford (18-4) rolled to 4-0 victories at home. The Bears mauled No. 25 Auburn (19-9), and the Cardinal pounded No. 22 Rice (21-5). On Friday, Cal will play No. 9 Alabama, and Stanford almost certainly will face No. 5 USC. The Trojans meet No. 32 UC Irvine today at USC. USC (22-2) breezed to a 4-0 victory over Sac State (13-14), and the Anteaters (23-4) won 4-2 over No. 63 San Jose State (19-6). Both matches were at USC. Ali Facey of Cameron Park, near Sacramento, won the clinching match for UC Irvine. The sophomore saved two match points in a 4-6, 7-6 (0), 7-5 victory over Julianna Bacelar at No. 5 singles. The Cal men (16-9) earned a 4-1 win over Denver (12-12) in Gainesville, Fla. The Bears will take on No. 2 Virginia, the runner-up to USC the past two years, on Thursday. NCAA singles and doubles -- Stanford's Nicole Gibbs, the defending NCAA women's singles and doubles champion, heads the NorCal contingent in the individual events scheduled for May 22-27 in Urbana. Joining Gibbs in the 64-player singles draw are teammates Kristie Ahn and Krista Hardebeck. Gibbs and Hardebeck are seeded 9-16. Cal's Zsofi Susanyi and Anett Schutting are seeded fifth and eighth, respectively. Also receiving singles bids were Cal's Klara Fabikova, Santa Clara's Katie Le, San Jose State's Klaudia Boczova and Saint Mary's Jenny Jullien. Stanford will send two doubles teams: Ahn and Gibbs, seeded 5-8; and Stacey Tan and Ellen Tsay. Gibbs won last year's title with Mallory Burdette, who later decided to turn pro and forgo her senior year. The men's singles draw features Cal's Ben McLachlan, Stanford's John Morrissey and Sac State's Marek Marksoo. Cal's Campbell Johnson and Christoffer Konigsfeldt earned a doubles berth. All brackets will be released at a later date. USTA National Open in Elk Grove -- The top two singles seeds in the boys 16s fell at the Laguna Creek Racquet Club. No. 1 Kalman Boyd of Rancho Santa Fe in the San Diego area lost to Lane Leschly of Atherton 6-7 (9), 6-3, 6-1 in the first round, and No. 2 Adrian Chamdani of Santa Clara was ousted by Alexander Keyser of Danville 6-4, 6-2 in the second round. Leschly later joined Keyser in the quarterfinals, scheduled for today at 9 a.m. The girls 16 quarters will be played at the same time. National 30 Indoors in Gold River -- In today's men's singles semifinals at the Spare Time Indoor Tennis Center, No. 1 seed and defending champion Calle Hansen of Newbury Park will meet unseeded Jeff Thomsen of Newport Beach at 9 a.m., and second-seeded Jan Tiilikainen of Reno will face third-seeded Sherif Zaher of Folsom at 10 a.m. In the women's semifinals at 9 a.m., top seed and defending champ Romana Tedjakusuma of Tracy will take on unseeded Fanny Gamble of San Rafael, and second-seeded Ioulia Bolotova of Philadelphia will go against Francesca LaO of Bellevue, Wash. The Stanford men lost in the first round of the NCAA Tournament for the first time in 35 appearances, falling to No. 20 LSU 4-2 in Malibu. The No. 40 Cardinal (12-12) played without injured freshman Trey Strobel at No. 6 singles. No. 42 Chris Simpson clinched the victory for LSU (16-11) by beating No. 50 John Morrissey 7-5, 6-1 at No. 1 singles. Stanford has won 17 NCAA men's team titles but none since 2000, when the Cardinal won its fifth championship in six years. Riki, left, and Ben McLachlan of Cal. Meanwhile, the No. 18 Cal men defeated No. 33 Florida State 4-1 in Gainesville, Fla. Senior Riki McLachlan of New Zealand returned from a three-month injury layoff for the Bears, leading 6-2, 2-5 at No. 6 singles when the match was halted because Cal had clinched the overall victory. Riki's brother and teammate, Ben, defeated Dominic Cotrone 7-5, 6-3 at No. 1 singles. Ben, a junior, is ranked No. 38, and Cotrone is No. 92. The Bears (15-9) will play Denver, which beat host and No. 15 Florida 4-3, today at 1 p.m. PDT. The Sacramento State men lost to host and No. 4 USC 4-0. No. 16 Ray Sarmiento of the Trojans led No. 117 Marek Marksoo 7-6 (5) at No. 1 singles when the match was stopped. In the women's competition, No. 8 Cal and No. 12 Stanford breezed, but No. 40 Saint Mary's lost. Host Cal dominated Stony Brook 4-0. Zsofi Susanyi, ranked fifth in singles, returned for the Bears after suffering an undisclosed injury on April 26. The sophomore from Hungary routed Jackie Altansarnai 6-1, 6-2 at No. 3 singles. The Bears (17-5) will face No. 25 Auburn, a 4-2 winner over Saint Mary's, today at noon at the Hellman Tennis Complex. Host Stanford blanked Miami of Ohio 4-0 behind Nicole Gibbs, the NCAA defending champion in singles and doubles. The junior from Santa Monica crushed Nimisha Mohan 6-1, 6-0 at No. 1 singles. The Cardinal (17-4) will meet No. 22 Rice, which edged No. 53 Pepperdine 4-3,today at 1 p.m. at the Taube Family Tennis Stadium. From the not-so-old timers to the youngsters, this is a big weekend for Sacramento-area tennis. The $10,000 USTA National Men's, Women's & Mixed 30 Indoor Championships are scheduled for Saturday through Monday at the Spare Time Indoor Tennis Center in Gold River. The USTA National Boys and Girls 16 Open is set for the same days at the Laguna Creek Racquet Club in Elk Grove. Meanwhile, the Sacramento State men and women will visit USC today and Saturday, respectively, in the first round of the NCAA Championships. The USC men are ranked No. 4 and the Trojans women No. 5. Top seeds Calle Hansen and Romana Tedjakusuma will defend their men's and women's singles titles, respectively, in the 30 Indoors. Hansen, 6-foot-5 (1.96 meters), is a 33-year-old native of Sweden living in the Los Angeles suburb of Newbury Park. Tedjakusuma, 5-foot-2 (1.57 meters), is a 36-year-old native of Indonesia living in Tracy, near San Francisco. She reached a career-high No. 82 in the world at 17. Kalman Boyd of Rancho Santa Fe in the San Diego area and Nadia Gizdova of Columbia, Md., are seeded first in Boys and Girls 16 Open singles, respectively. Singles play in both Sacramento-area tournaments will start Saturday at 9 a.m. The singles finals of the 30 Indoors will be Monday at 9 a.m. (women) and 11 a.m. (men). The singles title matches of the 16 Open will be Monday at 10 a.m. for the boys and girls. Leading the Sac State men is sophomore Marek Marksoo, the Big Sky Conference co-Player of the Year from Estonia. Pacing the Sac State women is senior Rebeca Delgado, the Big Sky Player of the Year from Mexico. --No. 8 Cal women vs. Stony Brook today at 1 p.m. at Cal. --No. 12 Stanford women vs. Miami of Ohio today at 2 p.m. at Stanford. --No. 40 Saint Mary's women vs. No. 25 Auburn today at 10 a.m. at Cal. --No. 18 Cal men vs. No. 20 Florida Sate today in Gainesville, Fla.
--No. 40 Stanford men vs. No. 33 LSU today in Malibu. --No. 63 San Jose State women vs. No. 32 UC Irvine on Saturday at USC. Pac-12 Conference -- Cal and Stanford were shut out of the All-Pac-12 first team. But three Bears -- junior Ben McLachlan, senior Christoffer Konigsfeldt and freshman Campbell Johnson -- and Cardinal sophomore John Morrissey made the second team. No one from Cal or Stanford received honorable mention. Named to the first team were sophomore Marcos Giron of UCLA, junior Emilio Gomez of USC, senior Kyle McMorrow of Washington, sophomore Dennis Novikov of UCLA, junior Adrien Puget of UCLA and junior Ray Sarmiento of USC. Former Sacramento Capitals co-owner Ben Combs will hold an exhibition fundraiser for the UC Davis men's tennis team on Saturday, May 18, at his clay court in Orangevale, Calif. Challenge matches between the Aggies and contributors will begin at 10 a.m. at 8582 Westin Lane. The festivities, which include a barbecue and kegs of different beers, will end with a match between UCD's No. 1 doubles team of Adam Levie and Toki Sherbakov and some of the Sacramento area's best former pros at 2 p.m. The VIP table is still available for $500. Chef Kenny Vowel will serve salmon, shrimp, the finest steaks and adult beverages. The shady table also will come with a server and the best view of the matches. Anyone interested in donating to the team may send a check, payable to UC Davis Men's Tennis, to the above address (zip code 95662). For more information, call Combs at (916) 425-5889. Mardy Fish, Sacramento Capitals of World TeamTennis (2012-13) -- No. 42 in singles (+2), No. 338 in doubles (+2). Bradley Klahn, 2010 NCAA singles champion and 2011 NCAA doubles runner-up from Stanford -- No. 187 in singles (+1), No. 346 in doubles (+1). Scott Lipsky, 2002 NCAA doubles runner-up from Stanford -- No. 26 in doubles (no change), unranked in singles. Sam Querrey, San Francisco native, Capitals (2012-13) -- No. 18 in singles (+1), No. 109 in doubles (-1). Ryan Sweeting, Capitals (2012-13) -- No. 270 in singles (-5), No. 829 in doubles (+2). Dmitry Tursunov, Folsom resident from Russia -- No. 57 in singles (+1), No. 146 in doubles (+124). Mallory Burdette, NCAA singles runner-up in 2012 and NCAA doubles champion in 2011 and 2012 from Stanford -- Career-high No. 84 in singles (+1), No. 364 in doubles (-2). Raquel Kops-Jones, 2003 NCAA doubles champion from Cal -- No. 14 in doubles (no change), No. 1,133 in singles (-6). Megan Moulton-Levy, Capitals (2013) -- Career-high No. 63 in doubles (+2), unranked in singles. Maria Sanchez, Modesto product -- No. 124 in singles (-9), No. 123 in doubles (no change). Taylor Townsend, Capitals (2013) -- No. 349 in singles (no change), No. 533 in doubles (-2). Madrid (men), early rounds, Tennis Channel, 5 a.m.-2:30 p.m. (live), 2:30 p.m.-midnight (repeat). Madrid (men), quarterfinals, Tennis Channel, 6 a.m.-3 p.m. (live), 7-9 p.m. (repeat). Madrid (women), quarterfinals, Tennis Channel, 3-7 p.m. (delay). Madrid (women), semifinals, Tennis Channel, 2-6 a.m. (live). Madrid (men), semifinals, Tennis Channel, 6:30-9 a.m. (live), 10 a.m.-12:30 p.m. (live). (men and women), semifinals, Tennis Channel, 12:30-11:30 p.m. (repeat). Madrid (women), final, Tennis Channel, 4-6 a.m. (live), 9:30-11:30 a.m. (repeat), 6:30-8:30 p.m. (repeat). Madrid (men), final, Tennis Channel, 7-9:30 a.m. (live), 11:30 a.m.-2 p.m. (repeat), 4-6:30 p.m. (repeat), 8:30-11 p.m. (repeat). Friday-Monday -- $10,000 USTA National Men's, Women's & Mixed 30 Indoor Championships, Spare Time Indoor Tennis Center, 11205 Pyrites Way, Gold River, Calif., 95670, www.usta.com, www.sparetimeinc.com. Friday-Saturday -- NCAA Men's and Women's Team Championships, first and second rounds at campus sites, www.ncaa.com. Saturday-Monday -- USTA Boys and Girls 16 National Open, Laguna Creek Racquet Club, Elk Grove, Calif., www.norcal.usta.com. Saturday-Monday -- USTA Boys 14 National Open, Harbor Bay Club, Alameda, Calif., www.norcal.usta.com. In the May 5 and 6 posts on the Rio del Oro Junior Championships in Sacramento, I corrected Jessi Muljat's opponent in the girls 16 singles final. I also added photos to both stories and the results of all the other singles and doubles finals to the May 6 story. Dmitry Tursunov has spent the past three months rebounding in singles. Now he's starting to do the same in doubles. Tursunov, a 30-year-old Russian based in the Sacramento area, and Jarkko Nieminen of Finland defeated Marcos Baghdatis of Cyprus and Eric Butorac of Rochester, Minn., 6-1, 6-4 on Sunday to win the BMW Open on clay in Munich. Both teams were unseeded. "I think today both of us were so nervous and so tight," Tursunov said on atpworldtour.com. "We're just glad it's finally over. It wasn't the prettiest match for both teams, but we had some good points. "It helped us (this week) that the courts were a little bit slow with the weather and conditions, so we were able to hit a lot of groundstrokes. It's tough for the doubles guys; they're so used to high-paced shots. We were able to take our time and pick our spots." Tursunov and Nieminen upended top seeds Alexander Peya of Austria and Bruno Soares of Brazil in the Munich quarterfinals and No. 3 seeds Julian Knowle of Austria and Filip Polasek of Slovakia in the semifinals. With the sixth ATP World Tour doubles title of his career but first since late 2010, Tursunov skyrocketed 124 places in the rankings to No. 146. He reached a career-high No. 36 in 2008. In singles, Tursunov has improved from No. 122 to No. 57 this year. He has been as high as No. 20, in 2006, during his injury-plagued career. A right-hander with a two-handed backhand, Tursunov missed three months early last year with a left wrist injury and never got untracked in 2012. He also missed this past January to rest nagging back, left wrist and right shoulder injuries. Tursunov has won seven ATP singles titles. The Munich crown was his first on clay in singles or doubles. All of his doubles titles have come with different partners. Ironically, Nieminen handed Tursunov probably the most heartbreaking loss of his career, prevailing 7-5, 6-4, 6-7 (2), 6-7 (6), 9-7 in the round of 16 at Wimbledon in 2006. It's the closest Tursunov has come to reaching the singles quarterfinals of a Grand Slam tournament. In doubles, Tursunov has advanced to the quarterfinals twice and semifinals once in the French Open with countryman Igor Kunitsyn from 2007 to 2009. Tursunov and Butorac both have played for the Sacramento Capitals in World TeamTennis. Tursunov was named the WTT Rookie of the Year in 2004 for Sacramento, and Butorac competed for the Capitals in 2008. They were teammates for one match in 2008. Juniors -- Cameron Klinger of San Jose defeated Nikita Matveyko of Kirkland, Wash., 7-5, 6-2 to win the boys 18 singles title at the Rio del Oro Junior Championships in Sacramento. Both players were unseeded. Matveyko served for the first set at 5-4. "I played a couple good games to win the set," said Klinger, whose height (6-foot-2) and power belie his age (15). "I think that hurt him mentally (in the second set)." Klinger, who swept the USTA national boys 14 singles and doubles titles in 2011, was playing in his first tournament in two months. "I was burned out," he explained. "I spent three or four months (playing) in Florida. I feel a lot better now." Klinger recently began working with Fresno-based Brad Stein, the former coach of International Tennis Hall of Famer Jim Courier. In the girls 18 final, unseeded Emma Critser of Mountain View in the San Francisco Bay Area beat fifth-seeded Karina Vyrlan of Sacramento 6-2, 6-4. Critser is a high school junior; Vyrlan, a 14-year-old freshman, has been home-schooled since fourth grade. Fifth-seeded Jessi Muljat (pronounced Mul-yat), 12, of Gold River in the Sacramento area topped unseeded Maria Kozyreva of Granite Bay 6-4, 6-4 to win the girls 16 singles title. Boys 16 singles -- Lane Leschly (8), Atherton, def. Trenton Neild (9), La Selva Beach, 6-1, 6-2. Boys 14 singles -- Keenan Mayo (2), Roseville, def. Austen Huang (1), Elk Grove, 6-4, 4-6, 6-0. Boys 12 singles -- Stefan Leustian (6), Mather, def. Aidan Mayo (3), Roseville, 7-5, 6-2. Girls 14 singles -- Jillian Taggart, Fair Oaks, def. Ashley Yeah (5), Los Gatos, 6-1, 6-0. Girls 12 singles -- Muskan Mahajan (4), San Ramon, def. Jennamarie Gordon (1), Los Altos Hills, 6-4, 6-1. Boys 18 doubles -- Wyatt Kershaw, Clovis, and Deric Wanland (1), Sacramento, def. Arshak Ghazaryan, Granite Bay, and Nikita Matveyko, Kirkland, Wash., 8-5. Boys 16 doubles -- Joseph Conlin, Alameda, and Jayson Fung, San Francisco, def. Peter Shin, Dublin, and Satyajit Simhadri (1), Saratoga, 8-2. Boys 14 doubles -- Austen Huang, Elk Grove, and Keenan Mayo (1), Roseville, def. Randy Cory, Salinas, and Andrew Ton (2), Milpitas, 9-8. Boys 12 doubles -- Mason Fung, San Francisco and Ryder Jackson (1), Nicasio, def. Ryan Ali, Mill Valley, and Ilan Leventhal (4), San Mateo, 8-3. Girls 18 doubles -- Bridget Guenard, Elk Grove, and Stephanie Lin (1), Pinole, def. Paige Cline, Kentfield, and Isabella Heidenreich, Napa, 8-6. Girls 16 doubles -- Darya Possokhova and Katya Tabachnik (1), San Francisco, def. Rebecca Li, Pleasanton, and Seriana Saltzen (2), Cameron Park, 8-6. Girls 14 doubles --Jenna Schlatter, Saint Helena, and Jillian Taggart, Fair Oaks, def. Niluka Madurawe, Sunnyvale, and Jacquie Tan, Elk Grove, 8-5. Girls 12 doubles -- Julia Owens, Los Altos, and Monica Stratakos (1), Saratoga, def. Alexandra Accinelli, Sacramento, and Jasjot Sandhu, Rancho Cordova, 8-2.